The Baymaster 9CF from Ben Pearson has the Features you need. Its a true asymmetrical design lift, and like all Ben Pearson lifts, it has all the features that provide the rugged durability you've come to expect from Ben Pearson. 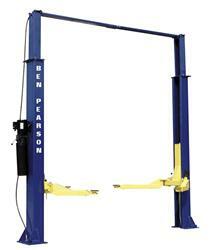 We've Put 9,000 Pounds Of Lifting Power And Ben Pearson Quality Into The Baymaster 9CF. Quality made. Performance tested. When you invest in Ben Pearson Baymaster 9CF you get both. Plus a whole lot more. Features. Rugged durability. Every Baymaster 9CF delivers all this and operator features that go beyond whats needed.